Considered as one of the Holiest of all Jain Teerths, Shikharji Temple in Jharkhand is one of the most visited Jain pilgrimage places. The temple is perched atop Parasnath Mountain, the highest among the Parasnath Range. This temple is popular among the Jain followers as this is the place where twenty out of twenty-four Tirthankaras attained Moksha or Freedom from the Cycle of Rebirth. 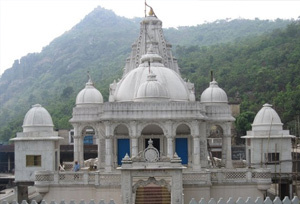 The name of the temple Shikharji has been given due to its location. Shikharji means the highest or venerable peak. The temple also gained a name as Sammed Shikhar or zenith of concentration. It is here that many Tirthankars indulged in meditative practices or Samadhi. The name of the hills where the temple is located is Parasnath, and the meaning of the word Parasnath is derived from the name of the twenty-third Teerthankara, Parshvanatha. He also attained Moksha at this temple. Today, this site is not only famous as a pilgrimage site but also a major tourist attraction. People visiting this place also enjoy adventure sports activities like Parasailing and Paragliding. To reach this temple, the pilgrims have to pass through the Madhuban Forest. The area between the Summit and the Gandharva Nala Stream is considered very holy by the Jainism Followers. The pilgrims go for a parikrama or a round trip, almost 54 km distance on foot or on a doli to complete the pilgrimage. Built in the 18th Century, the Shikharji Temple is known for its architectural splendor and historical significance. The idol is quite old but the religious sentiments associated with it are still strong. Beautiful murals on the temple walls showcase the basic tenets of the Jain religion. Dating back to 1678, some Sanskrit inscriptions can be seen at the base of the image. Pilgrims visiting this temple also visit Bhomiyaji Temple, located at the base of Shikharji Temple. Parasnath Station is the nearest Railway Station to reach this Temple. It is located in Dumri Jharkhand, almost 25 km away from Madhuban. Kazi Nazrul Islam Airport, Durgapur is the nearest Airport to reach this temple.